Brown the onion. If using fresh mince, brown the lamb mince at the same time. Add the onion and browned mince to the slow cooker with the carrots and peas. Pour in the stock, Worcestershire sauce and tomato puree, and season. Cook on low for 5 hrs or until the carrots are tender. Half an hour before the end of the five hours, peel and chop the potatoes and simmer them for 20 mins approx until tender. Mash the potatoes in the saucepan with the milk and butter. Spoon the mash on top of the shepherd's pie filling in the slow cooker. Cook for 1-2 hours more on low. Brown the top of the shepherd's pie under the grill for approx 20 minutes. 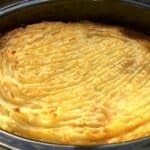 Serve the shepherd's pie straight from the slow cooker pot.